Structural, civil and hydraulic engineering services provided to Vos Constructions on a design and construct basis, including sufficient schematic information to enable costing and eventual tender success. The Brighton Rail Hub is located 25km north of Hobart. 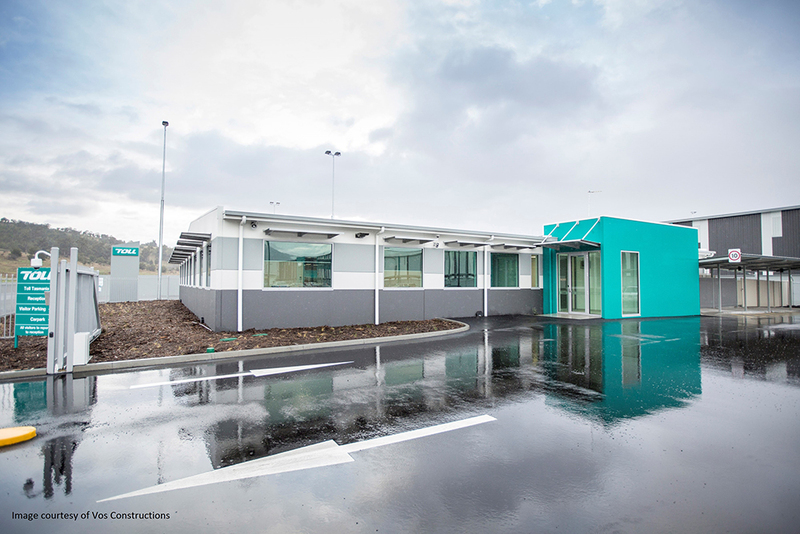 The Toll Tasmania depot provides an interstate and intrastate freight distribution service that includes the handling of shipping containers, palletised freight, ambient and temperature controlled freight forwarding services and fleet maintenance facilities. In addition to a number of ancillary buildings, the facility features a 17,000m2 warehouse, 38,000m2 concrete/heavy duty paver pavement and 24,000m2 light duty carpark. A number of fundamental concept changes were suggested during the pre-tender phase which resulted in improved functionality and reduced construction cost. The most significant was reconfiguring the roof to a one-way slope which enabled continuity between the main roof and the cantilevered canopy and removal of internal columns. A number of different traffic loads were stipulated within the Toll brief including a 110 tonne reach stacker axle, and stacked containers. The resulting heavy duty pavement design consisted of interlocking pavers, cement stabilised subbase and lime stabilised subgrade. The design was developed in conjunction with the civil contractor to take advantage of their local knowledge and capabilities. The facility was completed on time and on budget, and within specification.